JA88 constitutes our yearbook for 2012. This time, employing one year as a unit, we review Japanese architecture and draw out keywords from the architecture that is emerging from conditions in contemporary Japanese cities and society. These keywords, which define ways in which architecture must respond to the needs of a growing, diversifying society, can be said to provide architects with a creative framework. On this foundation, we expand our focus and take a global view of Japanese architecture in the context of the world’s architecture. Architecture that contributes to reconstruction in the disaster-stricken areas, new landmarks, pursuing urban redevelopment, preserving and revitalizing architecture, and proposing new ways of living—all were perspectives vital to architecture in Japan this year, but at the same time, how do such keywords appear when seen from the world’s perspective? 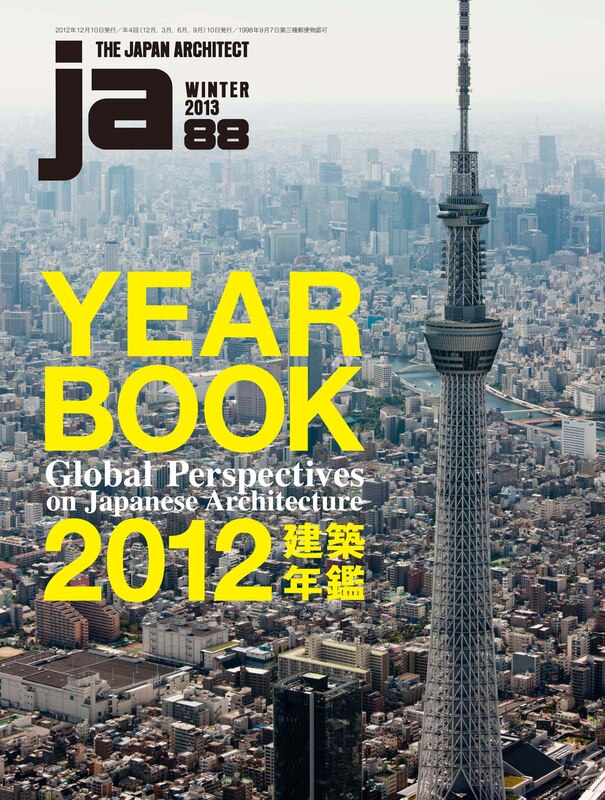 JA88 is a yearbook highlighting differences and similarities between Japan’s evolving architecture and that in the cities of the world, from varying aspects, to enable readers to ascertain the real potential of Japanese architecture.